Morocco is a mythical ancient country with a wealth of history, an eclectic population and architectural delights from grand palaces to the bazaars of the Medina. In the northwest of Morocco lies Marrakech, Morocco’s third largest city and most important former imperial city in the history of this country. Like many Moroccan cities, Marrakesh comprises both an old fortified city (the medina) and modern neighbourhoods, the red walls of the Marrakech, built by Ali ibn Yusuf in 1122-1123, have given the city the nickname of the “Red City” or “Ochre City” because of the red sandstone used. 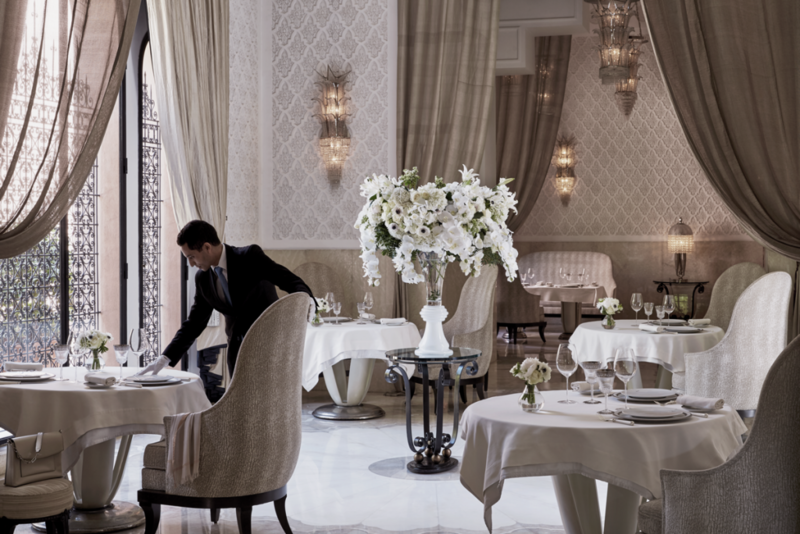 Nestled in the ancient walls of this grand city is the Royal Mansour, a luxurious location that is much much more than just a palace. 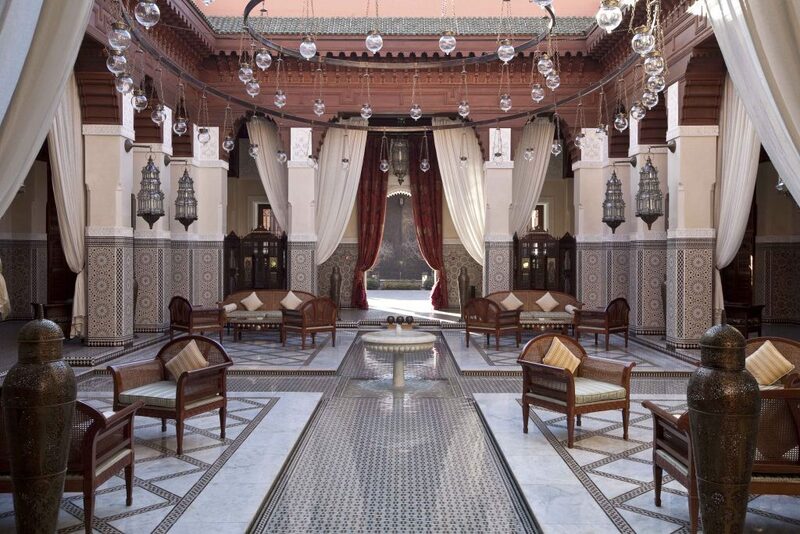 The meticulous design of the Royal Mansour has authentically replicated the classic forms of the traditional medina, with buildings, squares and gardens intersected with intricate winding paths and integrating the old wall in to the design of this magnificent retreat. 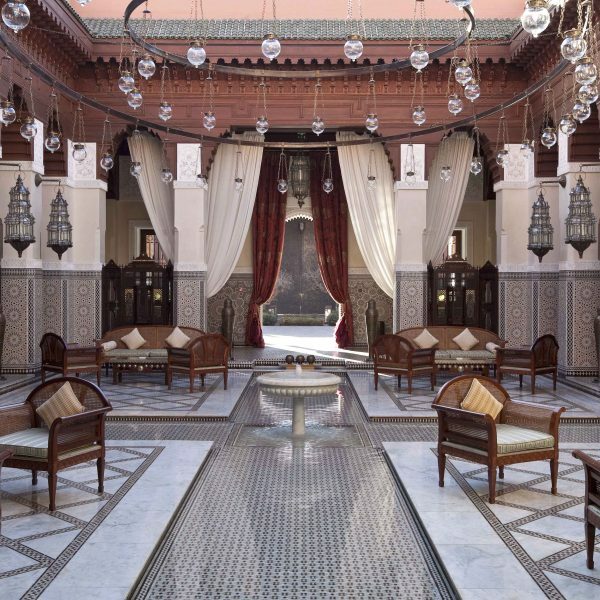 On a very hot summer day, luckily cocooned in an air-conditioned limo, I made my way through the great gate, past the charming courtyard and into the opulent entrance of the Royal Mansour. Greeted by the Director of Sales & Marketing, Karim Fehry Fassy, I was instantly made to feel very welcome and after a refreshing glass of fruit infused water I was shown to my private riad. 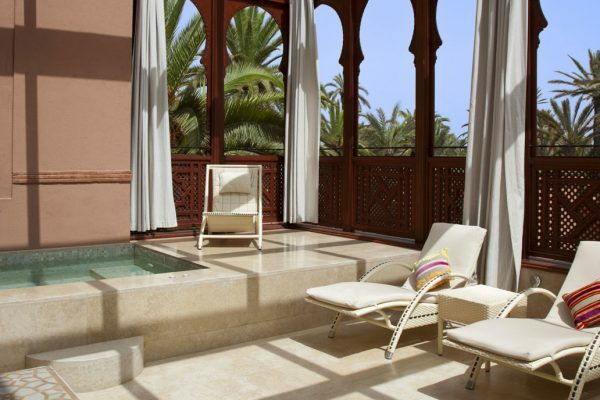 There are 53 individually designed riads on site, each over three floors and offering one to four bedrooms. 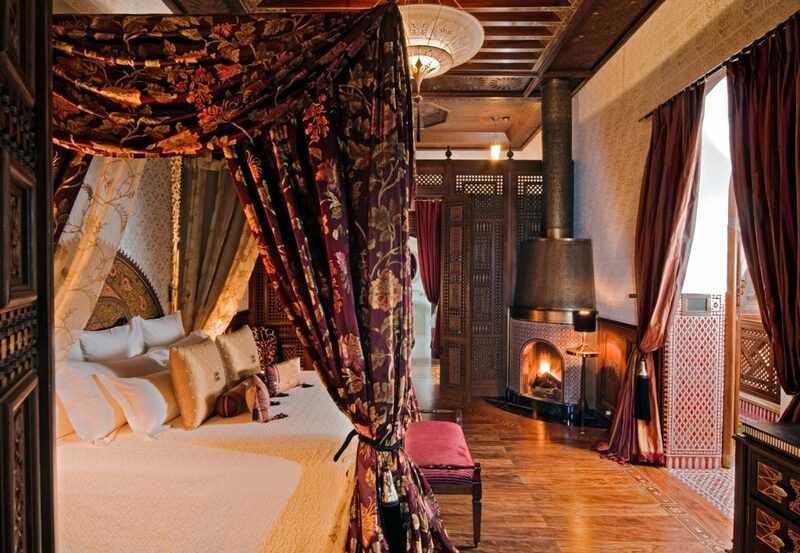 Like a traditional riad the rooms are arranged around a central open-air courtyard. As I swiped my very modern riad key across the electronic panel on the outside of the rustic iron door I accessed my own Moroccan paradise. I was greeted with the sound of flowing water from the fountain in the courtyard, scents from the flowers climbing the walls filled the air; I made my way through the glass door and in to the lounge, located off the hallway and stairwell. The lounge was magnificent, dressed in gorgeous tones of red and cream, dark woods with filigree and an open fireplace, plus a lovely welcome gift of chocolates and dried fruits (which were replenished on a daily basis). Off the hallway was also a kitchen with all the essentials one would need. Up the staircase, on the first floor, is a bedroom with bathroom; the bed is very large, definitely fit for a king and the headboard took my breath away, the attention to detail in the carving of the wood was awe-inspiring. The bathroom was equally as grand in white marble with a wet room type effect in the bath and shower area. Continuing up the staircase to the top floor you come upon a door, the heat of the African sun hits you as you open this heavy door to reveal a private terrace and plunge pool, a welcome private oasis on a hot summer day. Now to the secret doors, which it seems to the occupant of the riad leads nowhere, but this is the magical secret to the Royal Mansour, and what sets it apart from its local counterparts. Located through the kitchen on the ground and the walk in wardrobe on the first are heavy wooden doors, they relate to the riad instruction panels in the lounge and bedroom, it is all very mysterious but exciting, especially to a gadget geek like myself. The panel has a ‘Do Not Disturb’ setting which means that when you are in occupancy and this setting is activated no member of staff will enter the riad, when de-activated the staff can access the riad from the secret doors which lead from the service area where housekeeping, room service and the butler all operate from. By having the service area as a hidden element to the resort it means that you never see a member of staff walking the paths of the complex, it truly nurtures the feeling you are in a private residence and not in a hotel. After a dip in my plunge pool I headed to the bar for an aperitif before dining in the magnificent restaurant La Grande Table Francaise, a French cuisine restaurant by the very talented Michelin star chef Yannick Alléno, along with La Grande Table Marocaine, a Moroccan cusine restaurant, these restaurants make up the fine dining offerings at the Royal Mansour, and they do not disappoint. If you are after a more relaxed dining experience then there is also La Table, which is where I took breakfast, in the early morning sun serenaded by the small song birds in the trees and overlooking one of the many outdoor pools. 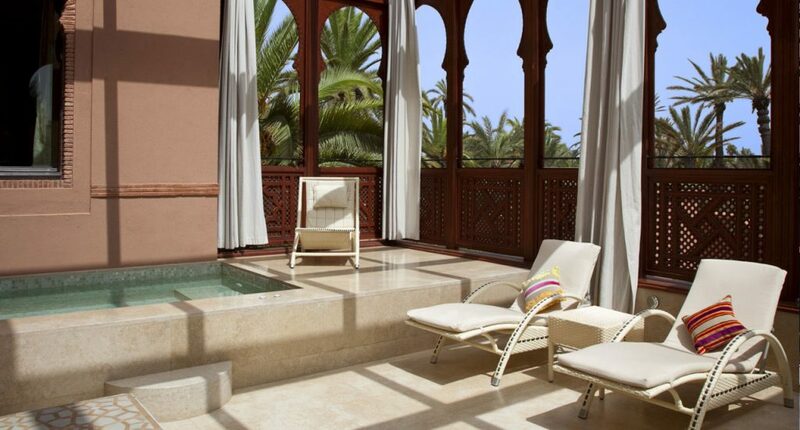 Onsite is also a sensational spa and indoor pool, located off the main medina housed in its own building the spa is a sanctuary away from the hot sun that stimulates the senses and encourages relaxation through the vast menu of treatments available. I experienced the traditional Moroccan Hammam, which was a very interesting and eye opening experience, I had never felt so clean and refreshed and partnered with my hair coiffured at the onsite salon I left there feeling like a Moroccan princess! 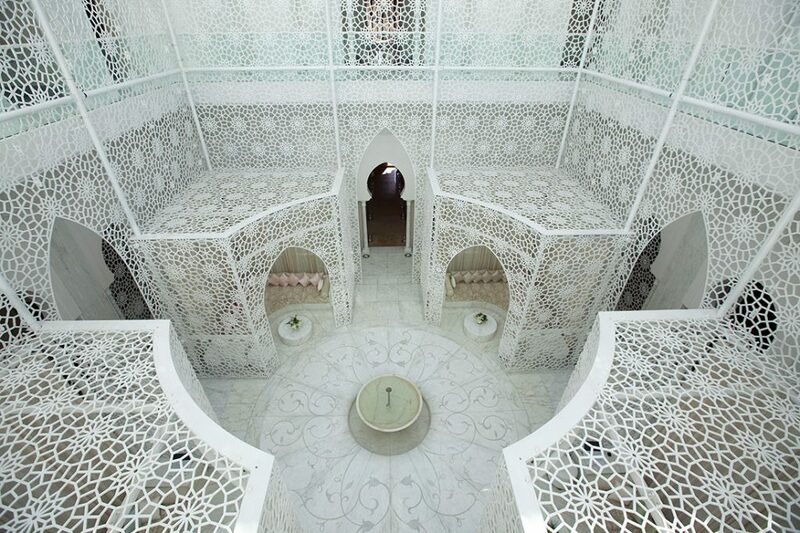 The Royal Mansour is truly unique; grand yet homely, traditional yet modern, secluded yet friendly. With so much to offer from exquisite fine dining to numerous places to unwind dependant on your preference including a cigar room, library, spa, formal gardens and several bars and courtyards one would wonder why you would stay in your private riad, but with each riad offering such a individual haven with the facilities of a hotel in a traditional setting why would you venture out? 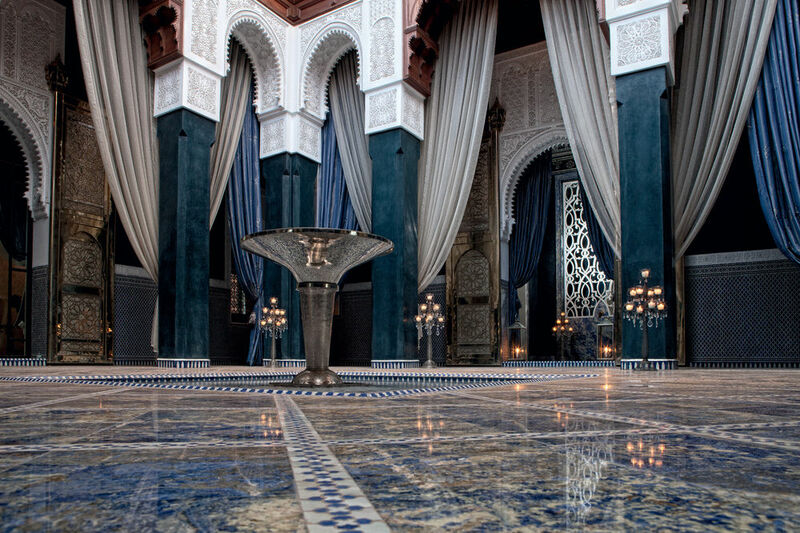 Much like the ancient history of Morocco embracing the contemporary of the modern world, Royal Mansour has found that perfect balance between old and new so whether you want to hide away from the world or experience the culture of Marrakech this regal retreat has something to suit everyone.